As I was being outfitted in a full-body dry suit, I began to think that this might not have been the greatest idea. I took years of swimming lessons growing up, but I'd never been a huge fan of water. I attribute this to my dad throwing me in the pool or dunking me as a kid, but I digress. The opportunity to see Silfra Fissure — where the tectonic plates of North America and Europe meet and are literally tearing Iceland apart — was too exciting and so onward I went. Our guide asked me if the hood was too tight around my neck. I told him yes and that it felt like someone had their hands around my throat. "Perfect!" our guide shouted, "you want it to be tight so that no water leaks in." After the five other people in my group were dressed, we were lead down some stairs to where we would be entering the water. We paused at a landing and were told to spit in our goggles and rub it around. This sounds super gross, but it actually serves a purpose. The spit acts as a surfactant, creating a layer of moisture so they won’t fog up when on your face in the water. So I spat, rubbed, rinsed, and then situated the goggles and snorkel on my face. We began to walk down the final set of stairs into the water. Bracing myself for the freezing cold water, I stepped in. The dry suits were awesome — I didn’t feel any chill. I put my face in the water and began breathing through the snorkel. About 30 seconds passed before water started to rush into my face mask. I went into full panic mode and started flailing around — trying to get my head above water. When you're in a dry suit, it's incredibly difficult to maneuver your body in any position that is not parallel with the water. Because air is trapped inside your suit, your entire body is buoyant AF. I kept trying to shift my body vertical, but any effort I made just resulted in my head being face down. I couldn't get my head above water and so I started breathing it in and then coughing and then breathing in more water before our guide rushed over and flipped me on my back. After coughing up water and catching my breath, he asked me what went wrong and I told him what had happened. He took off my goggles, re-situated them on my face, and then asked me if I wanted to try again. I was still terrified from the brush with death and told him I needed a minute to get myself together. After a little while of floating on my back, I was ready. My guide tightened the elastic cords around my mask and I proceeded to flip back over onto my stomach and put my face in the water. This time it worked. 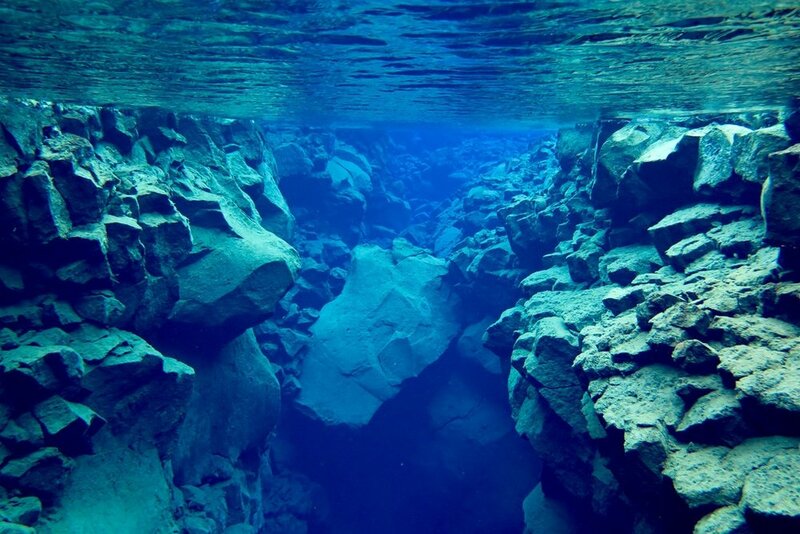 Silfra Fissure is beautiful. The water is crystal clear (so clean you can actually drink it) and it was breathtaking to know that the cavern I was seeing was where the North American / European tectonic plates divide. I was really starting to enjoy the experience when suddenly, water started flooding my goggles again. Having just gone through this, I didn't have a complete conniption — I knew to flip over onto my back. The guide came over and readjusted my goggles again and I flipped over to try again. We must have done this two or three more times before I finally gave up.